NASA’s MAVEN spacecraft in orbit of Mars has begun a series of aerobraking maneuvers with the planet’s atmosphere to lower its orbit as the craft prepares for its added task of serving as a communications relay station for NASA’s upcoming Mars 2020 rover scheduled to launch next year. 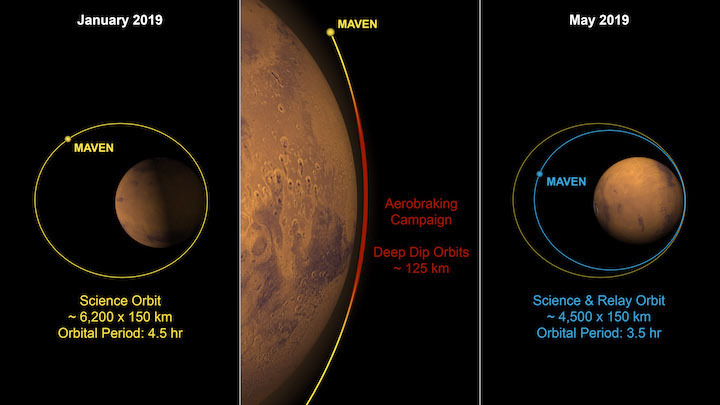 The orbit lowering operation comes four years after MAVEN’s arrival at the Red Planet and while the craft’s instruments continue to reveal how Mars’ atmosphere interacts with the solar wind, which recently involved solving a case of stolen electrons. The MAVEN (Mars Atmosphere and Volatile EvolutioN) spacecraft has been in orbit of Mars since 22 September 2014following a 10-month cruise through the interplanetary void between Earth and Mars. Launched on 18 November 2013 by a United Launch Alliance Atlas V rocket from Cape Canaveral Air Force Station, FL, the mission carried a primary duration of one Earth year. Like almost every single NASA mission, MAVEN has vastly outlived its anticipated lifetime thanks to its robust engineering and NASA’s plan from the beginning to utilize the satellite as a communications relay and for additional scientific observations of the Martian atmosphere after its primary mission was completed. In fact, the MAVEN team is carefully managing the craft’s onboard propellant supply for its thrusters to enable its continued operation through 2030. A mission duration for that long is not yet approved, but there is ample historical precedent – such as the Mars Reconnaissance Orbiter, Mars Odyssey, Curiosity, Opportunity, etc. – for the U.S. Congress to approve funding for mission extensions of Martian orbiters and rovers as long as they continue to function. For MAVEN, currently in one of its mission extensions, NASA is preparing to shift part of the spacecraft’s primary duty to include a more robust and strong communications link with the recently-arrived InSight lander, the veteran Curiosity rover, and the upcoming Mars 2020 rover – Curiosity’s cousin. To provide this strong communications link, NASA is lowering MAVEN’s apoareion: farthest point from the surface in its orbit of Mars. When the craft first inserted into Martian orbit in September 2014, it entered a highly elliptical 6,200 by 150 km (3,900 x 93 mile) orbit. Over the course of its primary scientific investigations, controllers on Earth periodically lowered MAVEN’s periareion (point of closest approach to the Martian surface in its orbit) from 150 km down to 125 km (77 miles). MAVEN’s onboard propellant supplies and thrusters were then used to reestablish the craft’s 6,200 by 150 km operational orbit after each of these scientific dips that provided an opportunity to sample the Martian atmosphere in ways never before possible and add to MAVEN’s primary mission. Those dips now come in handy, serving in a sense as practice rounds for how the team is currently lowering MAVEN’s orbit using aerobraking with the Martian atmosphere instead of thruster firings. Aerobraking, in this case, is the practice of using friction with the Martian atmosphere to gradually reduce the apoareion of MAVEN’s orbit while at the same time not dipping the spacecraft too low into the atmosphere to the point where heating would damage the orbiter. A bonus, especially for NASA’s long-range plans for MAVEN, is that aerobraking preserves on-board fuel supplies and is actually the most efficient way of changing a spacecraft’s orbit. Closer to Earth, NASA is also using aerobraking to lower the Van Allen Radiation Storm Belt Probes’ orbits, as reported by NASASpaceflight last month. For MAVEN’s aerobraking, the mission’s control team commanded a firing of the craft’s thrusters in mid-February to lower its periareion from 150 km to 125 km – the same altitude used for its scientific dips into the Red Planet’s atmosphere. 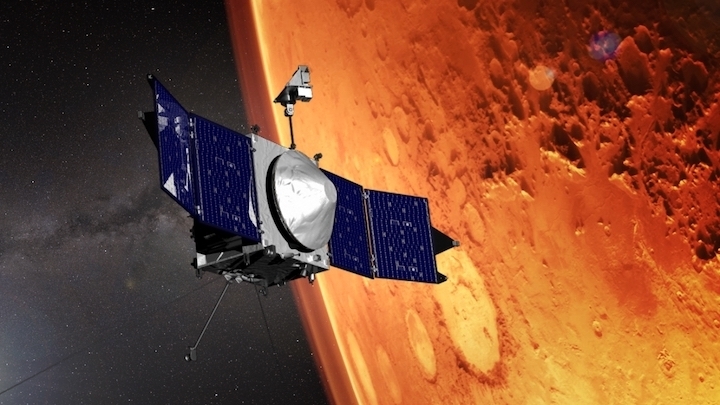 The lower orbit sets MAVEN up for roughly 360 brushes with Mars’ atmosphere over the following 10 weeks. 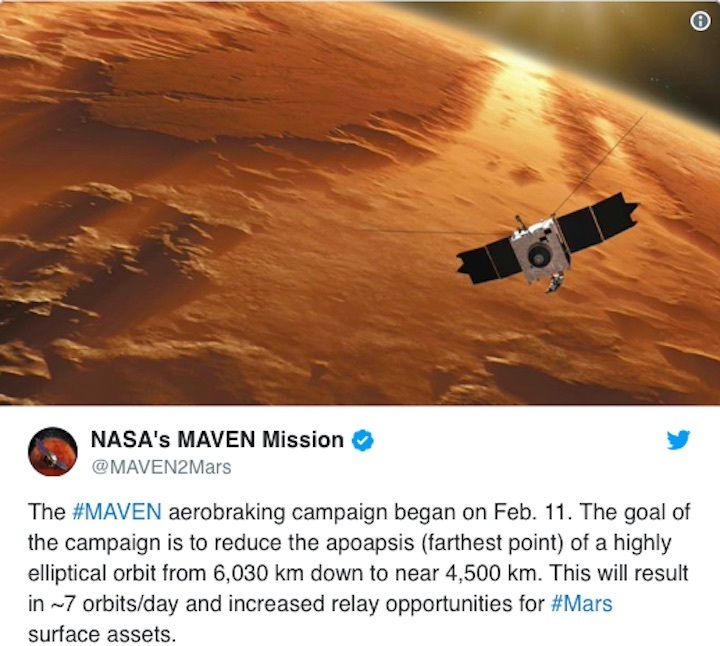 By the beginning of May 2019, the aerobraking process will be complete, and MAVEN’s apoareion will be roughly 4,500 km, or just under 2,800 miles. Once apoareion is at 4,500 km, controllers will use a small amount of propellant and MAVEN’s thrusters to raise the craft’s periareion back up to 150 km so that MAVEN does not encounter the Martian atmosphere on subsequent orbits. The new 4,500 x 150 km orbit will decrease MAVEN’s orbital period from 4.5 hours to 3.5 hours and will increase the number of orbits per day from 5.3 to 6.8, permitting more frequent communications with Curiosity and InSight. As the prime reason for lowering MAVEN’s orbit is to provide communication with the upcoming NASA Mars 2020 rover, that mission is continuing on schedule for a planned launch No Earlier Than 17 July 2020 at the opening of the interplanetary launch window between Earth and Mars from the mission’s launch site at Cape Canaveral Air Force Station, Florida. The Mars 2020 rover, which will get a more colloquial name as Curiosity did, is set to launch on a United Launch Alliance Atlas V rocket flying and its 541 configuration with a 5-meter payload fairing, four solid rocket motors, and a single-engine Centaur upper stage. The launch window extends from 17 July to 5 August 2020. If missed for whatever reason, the mission’s launch would have to wait another 26 months, until September 2022, for the next Earth-Mars interplanetary window. An on-time liftoff at the opening of the window will result in the Mars 2020 rover touching down via skycrane winch landing at Jezero crater, Mars, on 18 February 2021. Crucially, though, MAVEN’s new orbit does not preclude the continuation of its extraordinary science mission at Mars, and the craft will continue to study the structure and composition of the upper Martian atmosphere and how the atmosphere interacts with the solar wind. In the four years MAVEN has dutifully orbited Mars, its Imaging UltraViolet Spectrograph (IUVS) instrument has periodically detected a brightening of the ultraviolet light from hydrogen in Mars’ upper atmosphere. This brightening would happen for a few hours before the ultraviolet light levels would return to normal. As teams investigated what they were seeing, they discovered that these brightening events occurred at the same time MAVEN’s Solar Wind Ion Analyzer (SWIA) detected upticks in the number of enhanced solar wind protons (hydrogen atoms stripped of their single electrons by intense heat from the Sun) bombarding the planet. The mystery here is that this type of ultraviolet brightening – an aurora – should be impossible for two reasons: 1) protons should not be able to get past Mars’ magnetic shield bow shock that diverts the solar wind around the planet, and 2) protons can’t give off light because they lack electrons, a key component in auroral light emissions. Going back to the Sun where the solar wind originates, our solar system’s star continuously emits this stream of particles, mostly electrons, protons, and alpha particles. Due to the intense heat in the solar corona, hydrogen atoms can have their single electron stripped from them – creating a proton. Periodically, the Sun will throw a tantrum and blast out a burst of protons at speeds of 2 million miles per hour (3 million km/h). Based on the trajectory of these ejections, they can sometimes collide with the planets. Back at Mars, the Red Planet – like Earth – has a large cloud of hydrogen surrounding it. As it turns out, this hydrogen cloud holds the answer to the two mysteries of how proton-based ultraviolet auroras shouldn’t be possible on Mars yet are. MAVEN observations of a proton aurora. In the top panel, natural variability of the solar wind results in occasional dense flows of solar wind protons bombarding Mars. At bottom, observations by MAVEN’s IUVS show increased ultraviolet emission from the atmosphere when the solar wind is enhanced. Mars’ magnetic bow shock can only repel charged particles (such as protons), but neutral atoms can pass right through it – answering the first mystery of how the protons are getting through the planet’s bow shock. The stolen electrons also answer the second part of the mystery, as protons themselves cannot emit light but atoms (protons coupled with an equal number of electrons) can. As these protons-turned-neutral-atoms then slam into the Martian atmosphere, portions of their energy are emitted as ultraviolet light. Intriguingly, this discovery has helped MAVEN continue to build a history of Mars’ past and current climate, a key part of its primary scientific mission.